With beautiful beaches, lush jungles, fascinating wildlife and a truly unique culture, Bali is often referred to as a tropical playground for visitors of all ages. If you’re here with your family and looking for fun and exciting adventures for both kids and adults, these are some of our favourite Bali activities that the whole family can enjoy. 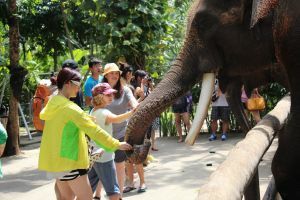 Animal lovers will definitely want to check out the Elephant Safari Tour where you can get up close and personal with spectacular Sumatran elephants. 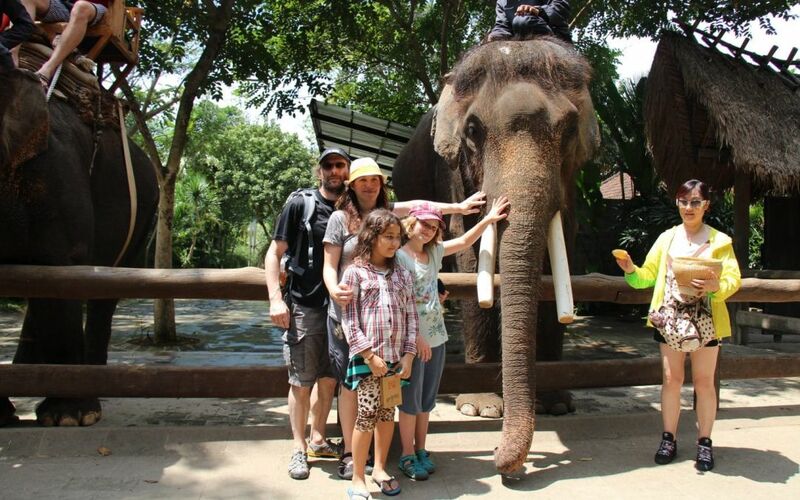 Your tour starts at the Elephant Safari Park in Taro, just a short drive from Ubud. Here you can watch the elephant show to see just how clever and coordinated these gentle giants are, and then climb aboard a teak chair on the back of an elephant for a trip through the jungle. After your elephant ride, you will have the chance to feed the elephants by hand before cleaning up and indulging in a sumptuous buffet lunch. Imagine sitting on a rocky perch high above the clouds and watching the sun’s rays peek out from behind a volcano. As the sun climbs higher, the sky morphs into shades of orange, yellow and pink, and the valleys, lakes and forests below come to life with warmth and color. 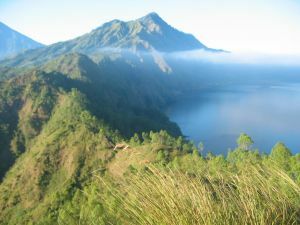 Our Batur Caldera Sunrise Trek is perfect for families with pre-teens and teenagers, as the trek is relatively easy-going and only takes about an hour each way. From the top of the caldera ridge you can see incredible views of the volcanic cones of Mount Batur and Mount Agung, the crater lake below and the coastlines of Bali and Lombok. 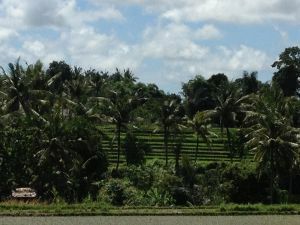 Escape the crowds on one of our nature tours that takes you out into the authentic Bali countryside where you can explore emerald green rice paddies and pristine forests with clean, clear rivers and secret waterfalls that cascade down the side of limestone cliffs. Be sure to bring your swimming gear because there will be plenty of opportunities to cool off in the freshwater pools under the falls. We offer two different nature treks: one in Sambangan (also know as the ‘secret garden’) and one that takes you to the famous UNESCO World Heritage Site of the Jatiluih rice terraces. 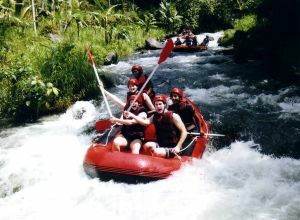 There’s no better way to beat the heat than on an exhilarating white water rafting trip down the scenic Telaga Waja River. At the starting point you will meet your professional English speaking guide, who will provide you with all the equipment you need like helmets and life jackets, and give you detailed safety instructions. 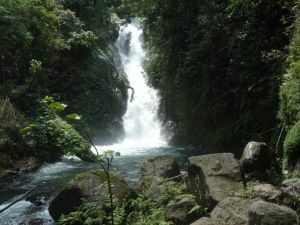 Then it’s off on a twisting, winding adventure along the gushing rapids and past towering cliffs, waterfalls, and walls of tropical jungle. If you like fast-paced adventures, this is the trip for you. Bedugul is located in Bali’s central highlands and boasts lush forests, farms and gardens and a much cooler climate than the steamy southern parts of the island. Join us on a tour of this fascinating area and let us take you to the Butterfly Zoo in Wanasari where little ones can let these colorful creatures alight on their hands, then to the largest botanical gardens on the island, lush coffee and clove plantations, and two sacred temples including the famous lakeside Pura Ulan Danu Bratan, which you can see on the Indonesian 50,000 Rp note.